Fox NewsSen. 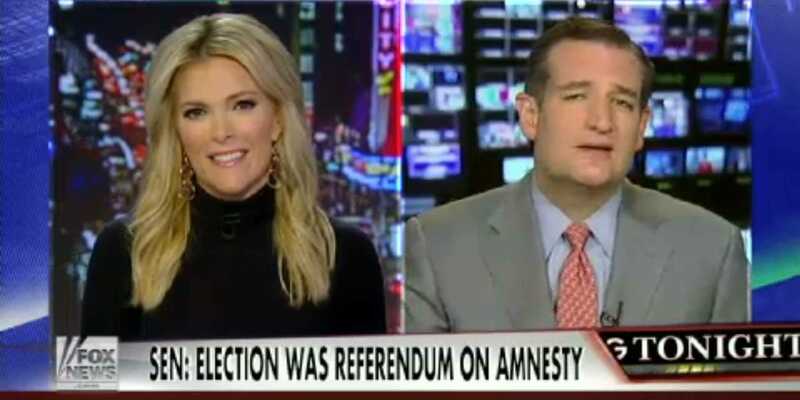 Ted Cruz (R-Texas), right, speaks with Megyn Kelly. Sen. Ted Cruz (R-Texas) isn’t buying White House’s spin on the last election — and he suggested administration officials might be on drugs if they truly believe what they’re saying about what the vote means for President Barack Obama’s upcoming executive action on immigration. White House Press Secretary Josh Earnest said on Wednesday that the message Obama took from the Republican midterm election landslide was the American people expected the president to make “progress” despite congressional gridlock. Cruz responded in an interview with Fox News host Megyn Kelly later in the day by joking the White House must be high on marijuana if they honestly believe that line. “If they’re spinning that the message of this last election is that Congress should suddenly agree with President Obama’s policies and roll over, then they have traveled to some of these states that have legalized marijuana and they have been smoking something. Because that ain’t what that election was,” Cruz quipped. Cruz, an outspoken conservative looking at potentially running for president in 2016, made the comments as he fiercely criticised Obama’s executive action on immigration, which is scheduled to be announced Thursday night. “There is not, in recent times, any parallel for a president, repudiated by the voters, standing up and essentially telling the voters, ‘Go jump in a lake,'” Cruz said. Cruz, who previously accused Obama of “acting like a monarch” in an op-ed published Wednesday, took the line to the next level with Kelly when he cited the Revolutionary War. “In the founding of our country, our framers were familiar with the monarchy; they were familiar with the despotic king. And we fought a revolution to be free from King George, to have the rights of the people protected by a Constitution, protected by a Congress. And if you read the Federalist Papers, they talk about the dangers of a despotic executive that rules by fiat,” Cruz said. Cruz further said the executive action was a “moment of testing” for Republicans, whom he called to take decisive action to block Obama. “If the president goes forward with this — if he goes forward unilaterally defying the Congress elected by the people, defying the American voters — then it’s incumbent upon Republicans in Congress to use every single constitutional tool we have to defend the rule of law, to rein in the president. So the president doesn’t become an unaccountable monarch,” he said.